Rent a cycle for the last leg of your travels where public transport doesn't go, and autos will overcharge! 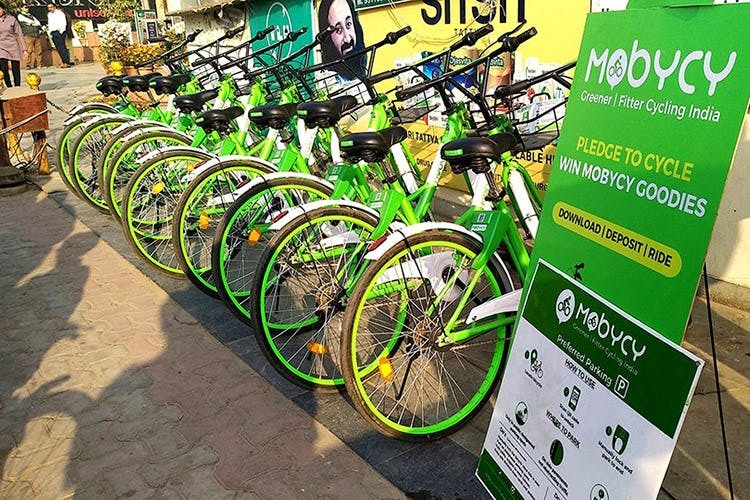 If you’ve spotted clusters of bright green bicycles on footpaths, they’re most likely cycles from Mobycy. An app based cycle rental service, Mobycy ease travel woes, without worrying about locking up the cycle once you’re done! This is especially awesome for those of you who use the metro/bus and need to finish the last leg of your trip which isn’t close enough to walk, but not far enough to take an auto without getting ripped off! Unlike other cycle rentals, this isn’t for a leisurely ride around the city (of course, you can if you want), but specifically for that last mile to your destination. At INR 5 for 30 minutes, who wouldn’t want choose that? Download the app, and pay a very nominal deposit (fully refundable) and locate a cycle near you. Once at the cycle, unlock it by scanning the QR code (the future is now!) and get to your destination. Once you’re done, end your ride on the app and manually close the inbuilt lock and you’re golden! Just don’t park the cycle anywhere though (we barely have space to walk on the sidewalk as it is! ), and ensure that it’s unobtrusive, yet visible for the next person rushing to their destination! Spot them around the CBD area, near colleges, and major commercial spots in the city. If you want one near you, just shoot them an email. More presence across the city. Currently, they're at too few location to make it easy to access.